I like popcorn. Most of the people that I know also like popcorn. And as I’ve taken to heart the research on vegetable oils causing wide spread inflammation throughout the body, I’ve had to readjust my snacking options. I used to love Fritos and Potato Chips. They were my go to snacks. But corn oil, canola oil, and vegetable oil are used in the processing of these snacks. Which makes these snack items potential food sources for inflammation. And while I will occasionally eat them, it’s no longer a daily snack item. Not even a weekly snack item. I’ll have them if I’m at a family party and they’re on the snack table. So when I saw that popcorn was bad for you I decided to find out why. And if I could save this snack item so that I didn’t have to give it up. What I found was pretty interesting. It’s both good and bad. Let’s first get the bad out of the way. It’s often laden with pesticides. It’s typically cooked in vegetable oil. 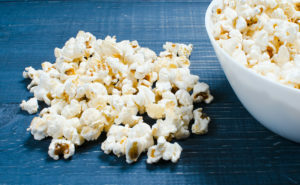 A medium bucket of Movie Theater Popcorn has 1200 calories and 60 grams of fat. Microwave bags can produce a cancer-causing agent called perfluoroctonic acid (PFOA) that is hard for the body to rid itself of. And then there is always the nutritional concerns about your toppings. Do you use butter? Do your toppings contain gluten or soy? Do your toppings contain MSG? Or fake dyes and coloring? I buy organic popcorn from my local health food store. No pesticides! I cook my popcorn in Avocado oil to lessen the chance for inflammation. I see about 5 movies a year in the theater (mainly Marvel movies) so I occasional eat a medium bucket of Movie Theater Popcorn so no big deal for me. I never have microwave popcorn. This gave me hope that I could continue to use popcorn as my go to snack. And what encouraged me to continue this snack food was the following good news about popcorn. If you don’t like an air-popper (I don’t), then cook it old school in a pot with a lid but use coconut oil or Ghee or Grass-Fed butter. For me it will be switching to coconut oil. For a topping I use hormone free butter and regular salt. Instead I’m going to switch to olive oil and sea salt. Other toppings that are healthy are Garlic Salt, Celery Salt, Rosemary, and Dried Thyme. High in antioxidants to help protect my body from free radical damage. Provides a significant amount of fiber to aid in digestion and stabilize blood sugar. Is a good source of manganese to help support bone health and prevent osteoporosis. And I’m using an organic, non-GMO product that supports the local economy while also helping me keep my one final snack item in place.